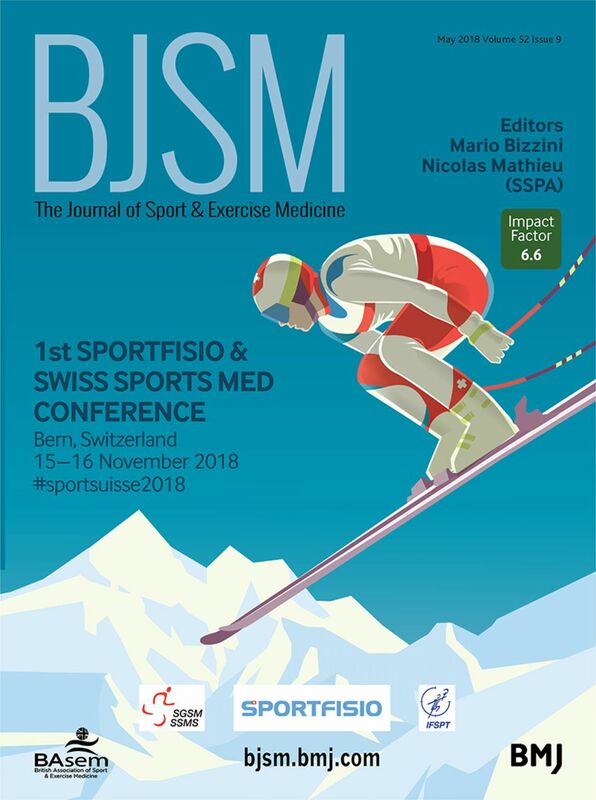 The Swiss Sports Physiotherapy Association (SSPA) will host the first combined conference with the Swiss Sports Medicine Society (SSMS) on 15-16 November 2018 at the BernExpo centre in Bern (figure 1 – the British Journal of Sports Medicine’s cover for this issue). We previously organised a two-day event in 2015, with the successful 1st World Congress of Sports Physical Therapy and almost 800 participants from 50 countries worldwide. Again, we hope to welcome sports PTs, MDs and others to enjoy our top-notch programme, and engage in discussions with peers from Switzerland and the world. Join the Swiss Sports Physiotherapy Association (SSPA) and the Swiss Sports Medicine Society (SSMS) in Bern on 15-16 November 2018. The main topics of #sportsuisse2018 will be: hip and groin problems in athletes, load monitoring and recovery in sports, and a special dedicated to the ‘Barca Innovation Hub’ (a unique example of cooperation between medical services, sport sciences, and team sport). We are pleased to report that ‘the best of’ clinicians and researchers will be in Bern. We have leading sport PTs (and PhDs) Kay Crossley, Joanne Kemp and Andrea Mosler (Australia), Mike Reiman (USA), Kristian Thorborg (Denmark) and May-Arna Risberg (Norway). Rounding out this expert PT (and PhD) group are orthopaedic expert Rintje Agricola (also PhD, Netherlands) and the person who made ‘Acute-Chronic Workload Ratio’ a household word – Tim Gabbett (double PhD – yes he did two!). It’s a programme worth travelling the world for but all in Europe can get to Bern within 3 hours! Well aligned with the conference programme, this issue of the British Journal of Sports Medicine (BJSM) features the work of Professor Kay Crossley, along with Dr Joanne Kemp both from Melbourne’s La Trobe University’s Sport and Exercise Medicine Research Centre, Melbourne, Australia. One of us (MB) visited La Trobe in January of 2019 (around the time of the Australian Open Tennis) and was impressed with how clinical work was informed by quality research. One of their research areas focuses on the hip joint and the femoroacetabular impingement (FAI) syndrome, which will be among the main topics of the conference. Two editorials (see pages 551 and 552) and papers on FAI development biomechanics (see page 566) morphology (see page 601) and imaging (see page 581) are featured in this issue, and will be subject of discussions at #sportsuisse2018. To advance management of hip problems, the Swiss Sports PT group is convening a retreat of leading international hip researchers who will develop the 2019 consensus on hip problems in sport to be submitted to the BJSM. It remains a massive problem as former world #1 tennis player – Andy Murray will readily attest. In this issue you will find the result of careful collaboration within the Danish Society of Sports Physical Therapy (DSSF) which commissioned a review on risk factors, diagnosis and non-surgical treatment of meniscal tears (see page 556); one of the most debated topics in knee orthopaedics. And if you missed the IOC consensus statement on paediatric ACL management you can find it for free at this link (http://dx.doi.org/10.1136/bjsports-2018-099060). And research is useless without appropriate study design so we highlight in this issue the study methods editorial by Dr Mohammad Ali Mansournia and Professor Doug Altman. The latter is one of the living legends of statistics – a true giant (see page 553). As always, keep track of the SSPA (@SportfisioSwiss) and BJSM (@BJSM_BMJ) via your favourite social media channel(s) and keep your member society abreast of what YOU want in your clinical sports medicine and physiotherapy career.